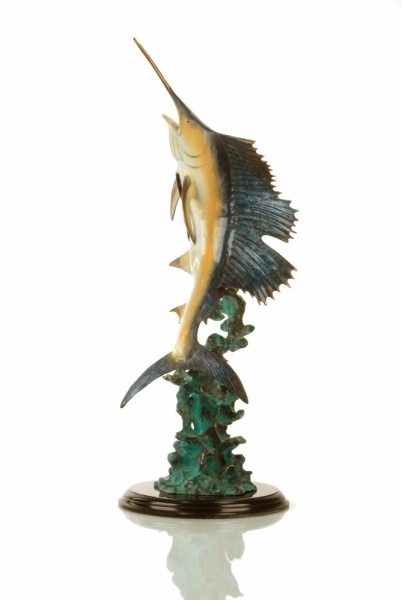 This unique and stunning Majestic Sailfish Sculpture is sure to be loved and admired by all. Each piece in the Patina Collection starts its life as a clay sculpture, and is then cast in brass using the lost wax technique, the same method used in casting fine jewelry, for unparalleled dimensional detail. The sculpture is then meticulously hand finished using proprietary hot patina finishes. The patina artists heat the brass surface with blow torches and apply secret formulations of chemicals that react to the metal using various techniques, one layer at a time. Several coats of hand waxing result in a vibrant, deep, layered finish with complex subtleties that no other finishing method can achieve. Due to this hand finishing process, no two sculptures are the same. Each piece is unique with its own color. We are sure you will love this beautiful piece of artwork and enjoy it in your home or office for years to come. 37 inches H. x 15 inches W. x 14 inches D.